With administration for the 2017 College Senior Survey (CSS) right around the corner (opening December 1st! ), we wanted to announce the release of the 2016 research brief and infographic highlighting findings from this year’s CSS administration. Leadership is key for the graduating class of 2016. Most of these students are confident in their leadership abilities, with seven out of ten (70%) graduating seniors believing that they are “above average” or in the “highest 10%” in leadership abilities compared to their peers. Furthermore, we found that about the same proportion (71%) reported that they value leadership potential when considering their career paths. 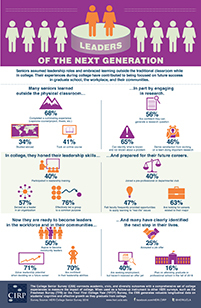 Some of this confidence may be attributed to students’ participating in leadership training (40%) and/or getting experience as a leader of an organization (57%). As institutions increase an emphasis on STEM engagement and retention efforts, we added questions to the survey aimed at capturing students’ perceptions of and sense of belonging to the science community. Among the new items added to the 2016 College Senior Survey are students’ agreement/disagreement with: I have a strong sense of belonging to a community of scientists, I derive great personal satisfaction from working on a team that is doing important research, I think of myself as a scientist, and I feel like I belong in the field of science. To note, as discussed in our research brief, women and men show similar interest in pursuing a career in a science-related field and feeling as though they belong in the field of science. Where men and women differ however is in having a sense of identity and belonging in the sciences. We found that women are less likely than men to think of themselves as scientists or to have a sense of belonging to a community of scientists, perhaps stemming from an underrepresentation of women in STEM fields. To read more about the graduating class of 2016, including their post-graduation plans, take a look at the 2016 College Senior Survey Research Brief. Looking forward to our upcoming 2017 College Senior Survey, we would like to highlight a few new items. As it is important for students to connect with faculty and build relationships that contribute to their success during and after college, the 2017 survey now asks students whether they have found a faculty or staff mentor. Additionally, we ask for students to rate their satisfaction with the racial/ethnic diversity of faculty at their college. Lastly, we updated the list of majors in 2016 and now in 2017 we have updated the list of careers. The new 2017 College Senior Survey can be found here for the paper version or here for the web version. And to register starting December 1st, click here!